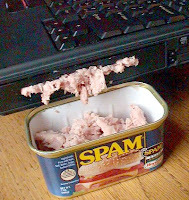 Spam and scams and other S words. My home email is weird. It seems every time there’s a success against spammers or other malware pundits, the amount of email getting through my filters actually increases. This morning for example I had 3 times as much through the filters (which I only tightened two weeks ago), and now I read this. It appears Brian Krebbs from Security Fix has, on the back of his assistance in the take down of EstDomains, struck a blow at another large hoster of malware and malicious websites. This is one I haven’t actually heard of before, McColo Corp. After gathering data on this company over the last 4 months, just the other day they contacted a few ISP hosts to see if they would assist in doing something about it. Although only one of them has so far, it has resulted in the homepage for the company as well as other sites of theirs vanishing in to thin air. Unfortunately some of their clients are still online, so we are waiting for the other ISP’s to react and to see what their reaction is. In other related news (so part of this post rather than as its own separate post), it seems SPAM isn’t quite as affective as researches used to think. Every mailing results in a significantly smaller return than previously thought. For example, one mailing of 350 million addresses resulted in only 24% making it to a mailbox. Of that 82 million, only 10,500 resulted in clicks, and only 28 resulted in a purchase. You can read more below.